Happy New Year Canada!!! 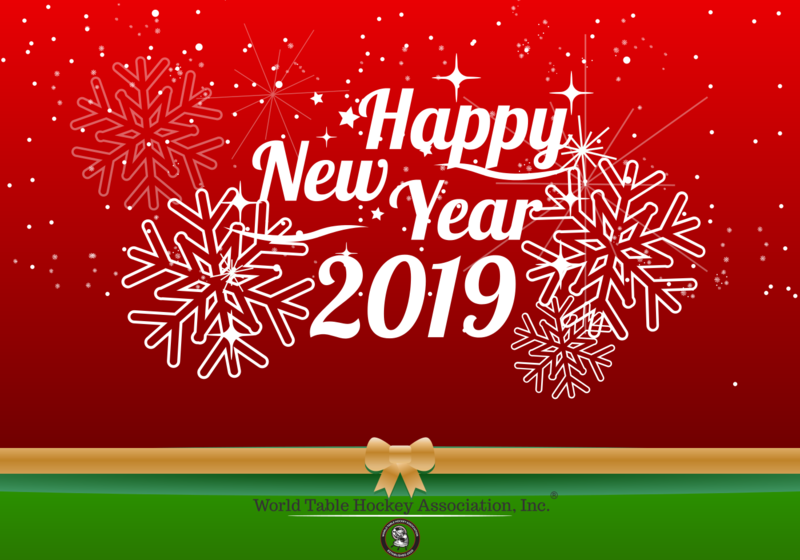 · The World Table Hockey Association, Inc.
Home / Blog Posts / Happy New Year Canada!!! By now, you and most everyone are back home from the holidays, returned to work or school and probably some of you have actually begun to keep your New Year’s resolutions. Good for you! We trust you had a wonderful holiday; that you spent quality time with your family and loved ones, socialized with your friends, enjoyed holiday food and drink, and entered the New Year confident that you would achieve or be one step closer to your goals in 2019. If you had a party and something did not get broken, or you didn’t step on a toy en route to the Christmas tree only to muffle a shriek as you tried to remain quiet in the wee hours to place gifts for the little ones who left that darn toy, or your Aunt Ida once again managed to place a kiss on your lips that you tried to direct to your cheek, then you were just not having fun or creating memories! Ha! We wish to thank the following people and organizations who have provided guidance, support, kind words and inspiration to us here, as we endeavor to get the WTHA, like an airplane on the runway to achieve a smooth take off. But, before we do, did you know that “Sport tourism is now the fastest growing segment of the tourism industry”? As we say good-bye to 2018, WTHA (Canada) gives thanks to the following people and organizations. (NOTE: Our mention people or organizations does not mean they endorse the WTHA (Canada). We are providing you with our experience and thanking them in public). Thank you to our lawyers Douglas Fyfe, Neil McCormick, and their staff at Gowling WLG (Canada) LLP. If you want legal experts who talk with you (not at you), who you will find personable and get the job done in a timely manner at a fair and reasonable cost then you should consider Gowling, WLG (Canada) LLP for your legal needs. Tip of the hat (thanks) to Webster, Chamberlain, and Bean, LLP in the States (see below) for suggesting Gowling WLG (Canada) LLP. Prior to moving to Gowling, WTHA (Canada) spent great time and money not achieving its legal goals. In short, WTHA (Canada) achieved its legal goals, because of Doug (Trademarks), Neil (Not-for-Profits, Governance), and their staff. For more than 100 years, Gowling WLG’s Ottawa office has served a broad range of clients to deliver exceptional solutions in the areas of intellectual property law, litigation and arbitration, and business law. Our Ottawa team includes many of the country’s leading and most highly recommended legal professionals, as well as a number of former senior bureaucrats who help our clients navigate the complexities of global regulation and legislation. NOTE: We receive no financial reward or discounts by telling you this. Rather, we enjoy the satisfaction in sharing our experience with you and help you avoid mistakes we made prior to moving to Gowling. We wish to thank the Canadian Sport Tourism Alliance (CSTA) for facilitating our networking, educational and communications opportunities and increasing our general knowledge of the sport tourism industry in Canada. For readers, we wish you to know that the WTHA (Canada) has the same “access to all of CSTA’s tools and templates, including the Sport Tourism Planning Template, STEAM (Sport Tourism Economic Assessment Model) and STEAM PRO, the Business Plan Template for Sport Events, etc” as do other members of the CSTA. We heavily relied on CSTA’s templates in building the framework of our recent Request for Proposal (RFP), released to the public on October 1, 2018. Further, as a small entity, we have found it important that we can count on CSTA staff to respond to questions in a timely manner by email or telephone, provide suggestions or point us to others as appropriate. [The CSTA has] over 500 members including 200+ municipalities, 250+ national and provincial sport organizations, 20+ educational institutions and a variety of product and service suppliers to the industry. Sport tourism is now the fastest growing segment of the tourism industry. Thank you to David Kraehling, retiring founding Board Member, Toronto (GTA), table hockey champion and organizer of tournaments at all levels, and moreover a longtime friend. We thank him for his counsel helping us build the WTHA from founding through today. Recently, TCWS has embarked on a new venture in the abrasives field. They now, “import and supply all types of abrasive products for manufacturing, welding, concrete, metal industries”. WTHA (Canada) thanks to Carlo “King” Bossio for lending his time providing insight into his business and his efforts in greater Québec, including providing games and tournaments for school children. Carlo is, in order, a multi-year tournament champion on the customized model 5380 table hockey game used in tournaments in Québec, New York’s tri-state area and beyond, evangelist of table hockey, and owner of Canada Hockey Table. “Canada Hockey Table,” can both manufacture and customize table hockey games for its customers. Carlo has met many current and retired National Hockey League (NHL) players, providing them and other celebrities from Québec his customized table hockey games. We thank Reggie Stefaniszyn for his continued support as a member of the WTHA (Canada) and WTHA (International) Board of Directors. Reggie is one of our intellectuals on our board. How many Boards of Directors can boast they have a member that studied at the l’Université de Paris-Sorbonne, Paris, France? We do! But wait there’s more! Reggie has other claims to fame. He was born in Viking, Alberta, Canada. Growing up he played ice hockey with some of the five brothers from one of the most famous families in the NHL, the Sutter brothers! Reggie has represented Canada on numerous occasions as a player in European table hockey tournaments using table hockey games manufactured by Stiga Publikt Aktiebolaget (AB), Sweden. (Publikt Aktiebolaget (AB) – means a public limited company). ← Previous Story History Made, Milestones Reached, and New Goals Set! Next Story → Is the WTHA, Table Hockey’s Answer for Success?